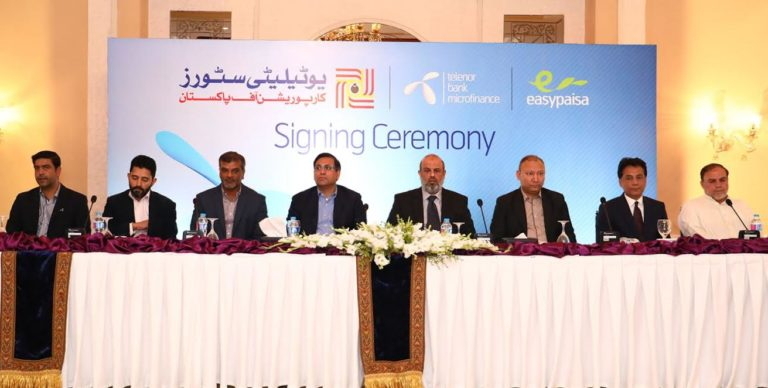 In a first-of-its-kind partnership,Telenor Microfinance Bank joins hands with Utility Stores Corporation (USC) to makeits mobile money service, Easypaisa, available at Utility Stores nationwide. The agreement was signed in Islamabad between Ali Riaz Chaudhry – President & CEOTelenor Microfinance Bank, and Waseem Mukhtar Chaudhary – Managing Director Utility Stores Corporation, in the presence of respective management teams. This partnership is in line with Telenor Microfinance Bank’s ambition to revolutionize Pakistan’s financial landscape and extend the benefits of mobile money to the under-banked people in the country.USC is a state-owned, largest retail chain store enterprise in Pakistan, providing basic commodities at low rates to the masses. Commencing with 50 stores in Islamabad and Rawalpindi, the project will gradually expand to over 5,000 Utility Stores spread across the country.